Come and share the story about how strands of fibre took Debbie around the world to explore this unpretentious, functional, versatile and most important of all exquisitely beautiful medium. From Debbie : "For me it is not just a medium to express oneself, it is an open book for us to dwell on our history, how human interacted with nature. As an artist, the testing question i always ask myself is how can we sustain this human civilisation to our advantage in the contemporary world without compromising our modern values." You are cordially invited to Fashion Mirage on Wed 7 Sept 9pm @ HKCEC Grand Hall - showcase of over 40 HK Fashion Designers (HKFDA-CreateHK-HKTDC) where Debbie LEUNG will be showing her collections. For tickets, please visit http://www.hkuaa.org.hk/EventDetail.asp?uid=864 . *For table reservation, please let us know if you will be joining dinner on registration. 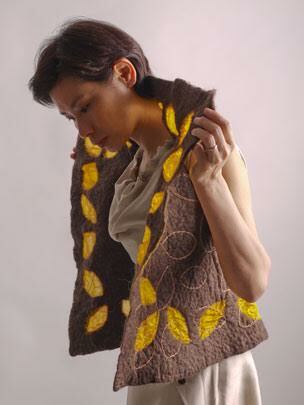 Participants will meet Debbie LEUNG and share her stories on the amazing fibre journey and appreciate her creations at studio. 1. Please complete the form in below with payment and email to Ms. Natalie Wong at natalie.wong@hkuaa.hk ON or BEFORE 24 October 2016. If you enroll together with your friend(s), please copy the form twice and complete it for your friend(s) as well. *Fee includes informal fusion dinner, home-made French snacks & dessert and a drink (a glass of house red wine/white wine OR Perrier). Participants are welcomed to bring their own bottle(s), corkage will be charged as of HKUAA Club policy. Graduated from business and law school in the 80’s in Hong Kong Polytechnic, University of Hong Kong and University of London. Debbie took a sharp turn in her career and became an artist 15 years ago. She strongly believes there is artist in everyone. She founded Hong Kong Craft Center and has been teaching felt making and natural dye in Hong Kong Design Institute, 中央美術學院 Central Academy of Fine Arts in Beijing, China, China Fashion Designers’ Association, Penland School of Crafts, US, New Zealand, Austrailia and other parts of the world. Apart from designing interior decorative and functional objects for international hotel chains and corporations, her works are exhibited and collected internationally. Debbie’s infatuation with handmade objects that convey to users the culture, skills and emotions of the artisan, has brought her to experiment with many different media. Her wearable art evolved from extended experience in ceramics, glass and mosaic. These media reinforced her interest and expression with colours, lines, forms and texture. In the past decade, Debbie has put her focus in textile. At the moment, she is collaborating with several charity organization and NGOs in promoting welfare for mental health patients and marginalized groups. Apart from using art and craft as a therapy, the objectives aim to enable the participants to improve their financial position and most important of all to build up their confidence and social skills. 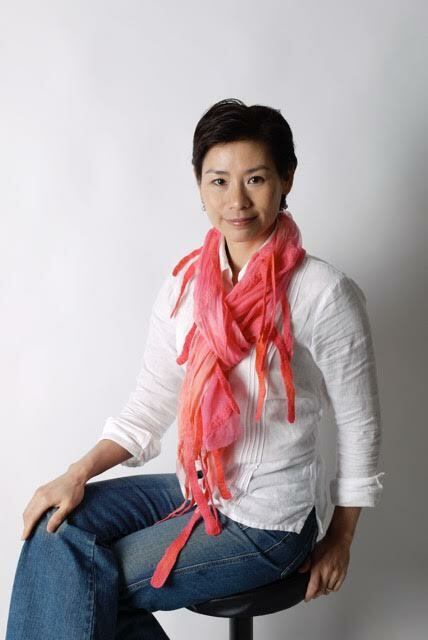 Currently she writes articles for magazine, curates exhibitions and being committee member of World Shibori Network (based in U.S. and Japan), Chairman of Hong Kong Glass Art Development Society, member of International Felters Association and Sustainable Fashion Design Association (U.S.).